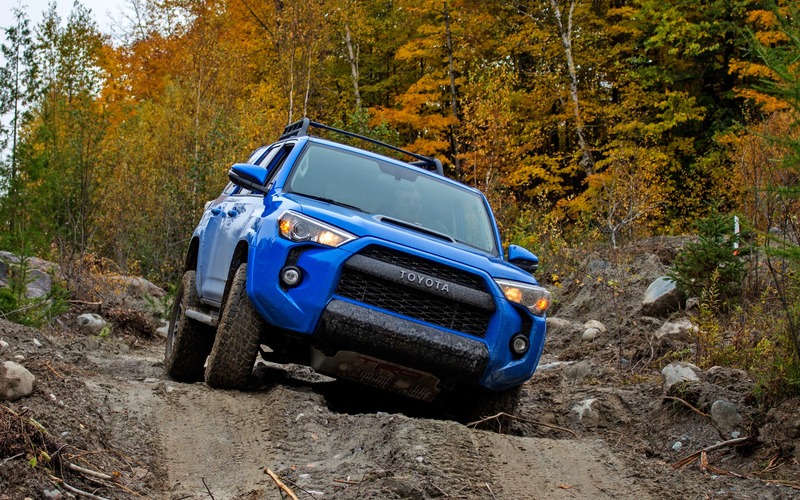 FRENCH RIVER, Ontario – In 2016, Toyota launched a new off-road series called TRD Pro, developed to meet rapidly growing consumer demand for off-road vehicles following the launch of the Ford F-150 Raptor. The TRD Pro series impacted mainly the Tacoma and Tundra pickups as well as the 4Runner midsize SUV, which were equipped with reinforced accessories to help them better confront rough terrain. The TRD Pro series started as a pilot project and Toyota was unsure how long it would last. Today, not only is the manufacturer racking up growing sales for all variants of its vehicles, but all TRD Pro versions put on the market in 2018 are already sold—and the year isn’t even over yet! Toyota has made its decision: the TRD Pro series isn’t going anywhere! The big news for 2019 is the return of the Tundra TRD Pro after a one-year hiatus. Mechanically unchanged, Toyota’s half-tonne truck is starting to look old and due for a major makeover. Will a new Tundra arrive in 2020? Toyota has so far refused to answer that question. The only available engine remains the 5.7-litre i-Force V8 generating 381 horsepower and 401 lb.-ft. of torque combined with a six-speed automatic gearbox. This gearbox is easily surpassed in sophistication by those of the Ford F-150, Chevrolet Silverado 1500, GMC Sierra 1500 and Ram 1500. Esthetically, the 2019 Tundra TRD Pro features a distinctive hood that includes a second (non-functional) air intake, a black high-performance exhaust pipe, new rims (also black), LED headlamps and Rigid Industries fog lights. Like the rest of the TRD Pro lineup, the Tundra features front and rear protective plates and a bigger gas tank.The suspension now includes Fox dampers with external reservoirs in addition to TRD springs.The 2019 Toyota Tundra TRD Pro retails for a starting price of $61,530 plus transport and preparation. In keeping with the tradition of introducing a new colour every model year for this series, “Voodoo Blue” is the new hue for 2019. Fox springs with external reservoirs also feature in the Tacoma and 4Runner TRD Pro. The Tacoma gets a new snorkel air intake to help it breathe better in the dunes. The 4Runner TRD Pro, meanwhile, comes factory standard with a multifunction roof rack. Like the Tundra, their powertrains are unchanged.The Tacoma TRD Pro is powered by the same 3.5-litre V6 generating 278 horsepower and 265 lb.-ft. of torque. It can be equipped with either an automatic or manual gearbox, both six speeds. For 2019, the 4Runner maintains the 4.0-litre V6 with 270 horsepower and 278 lb.-ft. of torque.The only available gearbox remains a very rudimentary five-speed automatic. The Toyota Tacoma starts at $56,435 while the 4Runner TRD Pro goes for $56,580 before transport and preparation. Let’s play in the mud! Toyota Canada prepared a muddy off-road circuit for us near French River, Ontario, just north of Lake Huron.The manufacturer also invited Yamaha, which provided a fleet of recreational vehicles so we could experience the TRD Pro adventure the same way a recreational vehicle owner would. According to Toyota, you’ll frequently see owners of these pickups towing recreational vehicles. Given the manufacturer’s longstanding partnership with Yamaha (the company helped design Toyota’s engines for the Lexus LFA and Toyota Celica GT-S, among others), it only made sense to work with Yamaha for this event. The circuit contained abrupt inclines, holes, blocks of wood and steep downhills, allowing us to test out the various off-road driving modes that the Tacoma and 4Runner offer. These include, among others, the Crawl Control system, a sort of speed regulator designed for off-road settings that helps the vehicle roll over obstacles, go down hills or get out of the mud, all without touching either the accelerator or the brakes. The system is efficient, but extremely noisy given that it often uses the antilock braking system to maintain cruising speed. It sounds like the vehicle is falling apart, but the folks at Toyota assure us that it’s perfectly normal. In all honesty, the site that Toyota selected was far too simple for what we were trying to accomplish. Many of us were of the opinion that these vehicles were capable of much more, as they managed to conquer obstacles without even breaking a sweat! After all, they are designed for “extreme” off-roading. And with competition like Jeep, which tests its machines on the Rubicon Trail, it would be nice to see Toyota challenge their “indestructible” trucks to the same extent. Nevertheless, the experience, which was followed by a ride in a Yamaha all-terrain vehicle, allowed us to gauge the off-road capabilities of each vehicle. The Tacoma proved to be the most agile of the bunch by far: light, manoeuvrable and even sporty if pushed to the limit on the beaten path. The 4Runner remains a stable vehicle. Although rudimentary due to its conservative design, it feels sturdy and solid on the ground and has no difficulty climbing when necessary. The Tundra, meanwhile, was a little more awkward. It’s big, heavy and long. Not ideal off-road, the vehicle got stuck in the mud easily. The fact that it lacks the same technologies as its peers means you have to control it the good old-fashioned way: with the brake and gas pedal. Some people prefer it that way, us included. But you can do the same with the Tacoma and 4Runner, which are generally better equipped to take on Mother Nature, even without Crawl Control. That said, Toyota’s TRD Pro vehicles, although rudimentary and expensive, are undeniably charismatic and will make you want to set off on an adventure as soon as you take the wheel. Plus, the new Fox suspension increases the smoothness of the ride both on the road and on trails. With reliability ratings and resale values through the roof—not to mention enormous popularity among consumers—Toyota’s decision to continue selling the TRD Pro series practically unchanged for 2019 is understandable. Now it’s time for the manufacturer to be bolder and organize a high-calibre off-road event to really test its lineup of adventure vehicles.